Mystic Saddle Ranch offers some of the best-guided hunts in Idaho. Whether you want to hunt elk, deer, bear, mountain lion or wolf, we can customize the hunting trip you will remember forever. Mystic Saddle Ranch has been a hunting outfitter in the state of Idaho for over 45 years. 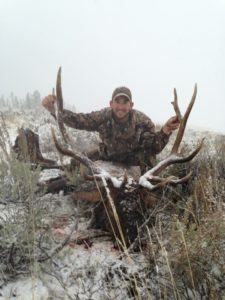 We offer general season hunts as well as trophy elk hunts in a draw-only unit. Mystic Saddle Ranch offers a variety of hunting options and locations. 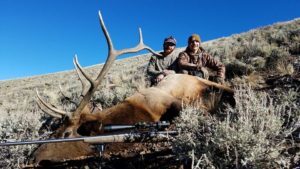 Hunt deer and elk in the highly desirable Stanley, Idaho area while staying at our comfortable bunk house or experience a wilderness hunt by getting packed into the White Cloud Mountains on our fully guided trophy elk, base camp hunts. Elk, deer, bear, mountain lion and wolf tags are available along with this hunt. This guided archery hunt is in the East Fork of the Salmon River drainage in the trohpy, Fish and Game Unit 36A-2. Due to minimal pressure of only 117 rifle hunters per year and excellent range conditions, this area is home to trophy elk and prime archery hunting opportunities. The hunt includes everything you need to make your archery hunt a success. The fully packed in camp allows for less travel and more hunting time, shoot either a cow or bull! Hunt elk while they are in the rut and experience a once in a lifetime archery hunt in the White Clouds Mountains. This guided rifle hunt is in the East Fork of the Salmon River drainage in a draw-only unit. The timing of this hunt is prime as the elk are still bugling and are still with their cows. The unit has very minimal hunting pressure and is known for trophy elk. The 36A-2 Idaho Fish and Game unit holds some of the most desired elk tags in the state of Idaho with only 117 rifle elk tags drawn per year. MSR has four allocated rifle tags that are sold on a first come basis. Don’t miss your opportunity to hunt this trophy elk unit! The hunt is fully packed in to a base camp in the White Cloud Mountains that allows you to access the best hunting areas right at daybreak. Price is two hunters per guide unless paying for a private hunt. This guided mule deer hunt is in the East Fork of the Salmon River drainage in the Fish and Game Unit 36A-2. The deer hunt is fully packed in to the White Cloud Mountains and takes place during the later part of the season. This makes for prime mule deer hunting as the bucks are moving lower in elevation and starting to rut. Staying at our base camp allows for you to hunt daily on horseback in excellent deer habitat using hunt and stalk methods. This deer hunt can also be paired with a cow or bull tag if you are successfully drawn for the area. When you deer hunt in Idaho, deer tags are also interchangeable for wolf, bear and mountain lion. These hunts are based out of Challis, Idaho. Hunting takes place in the East Fork of the Salmon River drainage in the Fish and Game Unit 36A-2. These hunts are later in the season so the elk have since migrated to their wintering grounds in lower elevation, exposing them in open areas. This makes for great hunting opportunities in lower country. Hunters will leave from Challis daily and utilize access roads and ATVs to prime hunting locations. Stock can be used if necessary or desired to hunt and retrieve game. Hunters are responsible for their own lodging and meals during this hunt. This hunt, meant for the serious Sportsman, it is the best Idaho has to offer. This hunt is in the head waters of the Middle Fork of the Salmon River in Fish and Game Unit 27. 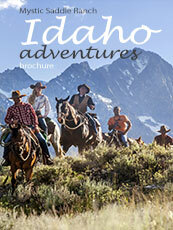 Pack into the Frank Church Wilderness on gentle mountain horses. By the middle of September, the elk are bugling and becoming very active. We hunt bull elk in this area by bugling and stalking. The area hunted is a blend of Douglas Fir, lush alpine meadows, and some burned areas. Burned areas provide young plant growth for great feeding areas for elk. We limit this hunt to 4 people all season to ensure you get the quality hunt that you’re looking for. Arrive in Stanley Idaho on the 13th of September. On the 14th we will head out early to start the 12 mile horseback ride into hunting camp. Enjoy a hearty western dinner and rest up for the exciting day of hunting ahead. Bull elk is our primary target, but you will also have the option to hunt mule deer, black bear, or Canadian wolf. The unique thing about a deer tag in unit 27 is that it allows you to harvest either a deer or a bear. Bears can be hunted on a bait site which would be set up prior to your arrival. The lush valley we hunt in gives great habitat for those trophy bears. This area is so concealed that it gives those big mule deer a place to hole up. We often spot them on those open sage brush slopes. Be sure to bring a fishing pole!! September is a great time to catch those hungry cutthroat and rainbow trout on the Middle Fork of the Salmon River. This hunt is designed to be where the elk are while keeping money in your pocket. Stay at our bunk house in Stanley ID, where you will be accommodated with a soft bed, hot shower, and good food throughout your stay. Hunt elk daily from horse back or foot from various locations and trailheads in Fish and Game Unit 36. We will be trying to locate elk by glassing the open grassy sage brush slopes and using a simple ride and bugle technique. This is a great hunt to get into lots of rutting elk. Only two hunters per week on this hunt to ensure success. The general season elk hunt in Stanley, Idaho is a pristine hunt that enables hunters to cover amazing country on horseback. Hunters are able to hunt prime elk and deer habitat while also enjoying spectacular views of the Stanley area and stay in an all-inclusive bunk house every evening. The hunters are provided with a knowledgeable guide that will maneuver his clients into optimal hunting areas daily. All clients will be accommodated with a soft bed, hot shower, and good western food throughout the hunt. 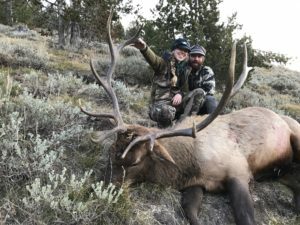 A high success rate for elk and deer has made this a very desirable hunt and can be booked out a year or two in advance. Clients are able to hunt deer and elk daily from horse back or on foot from various locations, allowing the clients to choose from multiple herds or more desirable terrain. The surrounding area has many open sagebrush slopes and wooded areas. By the month of October the weather is getting cooler, causing the deer and elk to be very active putting on weight to make it through winter. This hunt allows for a lot of mobility so as to intercept mule deer and elk as they begin to migrate.